ZURICH (AP) — FIFA is studying 13 different goal-line technology systems which could help match officials make more accurate decisions. FIFA said Monday that all the project proposals were presented last week, and will be further discussed at an Oct. 20 meeting of its rule-making body, known as the International Football Association Board. The IFAB panel will gather in Newport, Wales, to help set the agenda for its annual meeting next March when the laws of soccer can be changed. FIFA president Sepp Blatter re-opened the debate on using technology to help match officials after a series of mistakes affected the World Cup in South Africa, and helped eliminate England and Mexico from the tournament. Blatter had previously resisted high-tech help for referees by insisting that human error was part of the game. The panel also is scheduled to discuss worldwide trials using additional officials behind each goal to help referees rule on goal-line judgments and penalty area decisions. IFAB has scheduled the experiments to continue in competitions including the Champions League until June 2012. It could then approve the five-referees system for elite competitions instead of opting for technology. FIFA did not identify the 13 companies making proposals, who will not present their systems to the panel next week. They are expected to include the camera-based Hawk-Eye system which is currently used in tennis and cricket, and the Cairos team which has developed a microchipped ball. 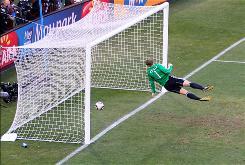 Both systems were rejected by IFAB in 2008 and again last March. Swiss watch firm Longines also has been reported as a likely candidate. IFAB is a 124-year-old body comprising the associations of England, Northern Ireland, Scotland and Wales, plus FIFA representing the other 204 soccer nations. Each British member has one vote, FIFA has four and a proposed new rule needs six votes to be passed. Long overdue, it will help resolve most disputed goals. Tell me about it ! Blatter and his cohorts are still living in the stone age.